What if they played a World Series, and nobody watched? In the most anti-climatic World Series since 1989 when the Loma Prieta earthquake disrupted the "Bay Area Series" the Philadelphia Phillies defeated the Tampa Bay Rays 4-3 Wednesday night. The win came two days after the start of the contest, which was suspended in the bottom of the sixth due to rain. These two teams deserved a better showcase than what the 2008 World Series devolved into. The Rays were the feel good story of baseball all year long, as they went from a team that had never had a winning season in its existence to going to "The Show." Philadelphia, a team that had been built patiently by General Manager Pat Gillick and manager Charlie Manuel had been close the last few seasons. This was the season they finally broke through, fittingly in Gillick's last season before retirement. The Series started off very well as the two teams split the first two games in Tampa Bay. But a three hour rain delay took some of the lustre of an exciting Phillies win in game three by a score of 5-4. Game four was just a one sided blow out as Philadelphia beat up the Rays 10-2 to take a 3-1 series lead. The series hit its low point Monday night as the two teams played in terrible elements until the game was finally called before the bottom of the sixth. It was deemed a suspended game and would resume where it had stopped. After a night of rain Tuesday night the two teams took the field Wednesday night all knotted up at 2-2. Rays reliever Grant Balfour took the mound and faced pinch hitter Geoff Jenkins who led off the inning with a double. 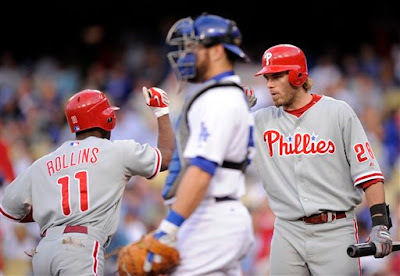 Jimmy Rollins put down the sacrifice getting Jenkins to third. Jayson Werth hit a bloop RBI single, and the Phillies were ahead 3-2. Reliever Ryan Madson could not hold the Philadelphia lead in the top of the seventh as Rocco Baldelli homered to let and tied the game at 3-3. J.P. Howell took the mound for Tampa Bay in the bottom of the seventh . Pat Burrell greeted him with a double to deep center to lead off the frame. Eric Bruntlett came into run for Burrell, Chad Bradford took over for Howell on the mound. Shane Victorino grounded to second, and Bruntlett went to third on the play. He scored as Pedro Feliz hit a RBI single to center for what would prove to be the eventual winning run. Phillies reliever J.C. Romero got the win, Brad Lidge the save, Rays reliever J.P. Howell took the loss. It is the first World Series win for Philadelphia since 1980. The Philadelphia Phillies exploded for ten runs Sunday night as they defeated the Tampa Bay Rays 10-2 in game four of the 2008 World Series. The victory gives Philadelphia a 3-1 lead in the series, and could close it out in front of their home fans Monday night. The Phillies blasted four home runs two by first baseman Ryan Howard, and one by starting and winning pitcher Joe Blanton. He is the the first pitcher since 1974 to hit a home run in the Fall Classic and only the 15th pitcher in MLB history to accomplish it. Philadelphia got on the board in the bottom of the first as Rays starter Andy Sonnanstine gave up a leadoff double to Jimmy Rollins. He went to third on a Jayson Werth fly out to right. Chase Utley walked, and then Ryan Howard hit the ball back to Sonnanstine. Rollins broke for home on the play and was caught in a run down. Although he appeared to be out the umpires ruled him safe at third, leaving bases loaded with one down. Sonnanstine then committed the cardinal sin of walking Pat Burrell forcing home the run. No further damage was done and it was 1-0 Phillies. Philadelphia scored again in the third as Utley led off the frame by reaching first on an error by second baseman Akinori Iwamura. Howard singled to right as Utley sprinted to third. Utley scored as Pedro Feliz drove him home with a single to left, making it a a 2-0 contest at the end of three innings. Tampa Bay got on the board in the top of the fourth as Carl Crawford hit a solo home run, making it a 2-1 game. Sonnanstine put himself in the hole in the bottom of the inning, as he gave up a three run blast to Howard putting the Phillies ahead at the end of four innings 5-1. Blanton gave up a dinger to Eric Hinske who pinch hit for Sonnanstine in the top of the fifth bringing Tampa Bay closer at 5-2. But Blanton got the run back in the bottom of the inning as he hit his historic shot Rays reliever Edwin Jackson (write this name down; it will win you a lot of bar bets in about five years!) putting Philadelphia ahead 6-2. The Phillies broke the game wide open in the bottom of the eighth as both Jayson Werth and Howard hit two run home runs, putting them up 10-2. Blanton got the victory for Philadelphia as he pitched 6 innings giving up 2 runs, on 4 hits, striking out 7 and walking 2. Sonnanstine pitched just 4 innings, allowing 5 runs, on 6 hits, walking 3, and striking out 2. Game five will be Monday night with a rematch of the game one pitchers. Scott Kazmir will look to keep things alive for Tampa Bay and Cole Hamels will be on the hill for the Phillies. If any game was worth sitting through a three hour rain delay, this may have been the one as the Philadelphia Phillies beat the Tampa Bay Rays in the bottom of the ninth by the score of 5-4 early Sunday morning. (I have sat through countless rain delays in the comfort of the Press Box in then Jacobs Field in Cleveland. It is not fun, but it must be ten times worse for the hardy fans that sit out the delay in the rain!) Phillies catcher Carlos Ruiz drove in the winning run in the ninth with an infield single. The victory gives Philadelphia a 2-1 edge in the 2008 World Series. Rays starter Matt Garza got into early trouble in the bottom of the first. He gave up a leadoff single to Jimmy Rollins and walked the next batter right fielder Jayson Werth. Garza appeared unnerved as he served up a wild pitch advancing the runners to second and third with nobody out. Chase Utley grounded out to third but Rollins scored on the play. The Tampa Bay starter was able to get out of the frame without further damage as the Phillies led 1-0. Philadelphia starter veteran Jamie Moyer did not enjoy his prosperity for long as Carl Crawford led off the top of the second with a double. After Dioner Navarro lined out to second, Crawford stole third. Rays right fielder Gabe Gross drove in Crawford with a sacrifice fly to center tying the game at 1-1. Carlos Ruiz hit a solo homer in the bottom of the frame off Garza to put the Phillies back on top 2-1. Things stayed quiet until the bottom of the sixth, when Utley and Ryan Howard hit back to back homers to lead off the frame. Garza got the next three hitters out in order, but the damage was done as his team now trailed 4-1. Moyer ran into problems in the top of the seventh as Crawford beat out a bunt for a single. Navarro came up next hitting a double to left, Crawford going to third on the play. Gross grounded out to first but Crawford scored on the play, making it a 4-2 game. Philadelphia brought in reliever Chad Durbin, who got Jason Bartlett to ground out to short but Navarro scored, and the lead was down to a single run as the score was 4-3. Tampa Bay played "small ball" perfectly in the top of the eighth. B.J. Upton greeted new Phillies reliever with an infield single to open the inning. He then stole second, then stole third, and scored as Ruiz threw the ball away. Madson had blown the save, and the game was tied 4-4. The last thing anybody wanted in this game after the initial three hour delay was extra innings, but that looked like a strong possibility as Philadelphia came to bat in the bottom of the ninth. However this time it was the Phillies turn to play "small ball" as pinch hitter Eric Bruntlett got on base when he was hit by a pitch. Bruntlett got to second on a wild pitch, and went to third on a throwing error by Rays catcher Navarro. Reliever Grant Balfour intentionally walked the next two batters trying to set up the force at the plate. But the plan backfired as Ruiz drove home the winning run with an infield single. Phillies reliever J.C. Romero got the win, Rays reliever J.P. Howell took the loss. The Series resumes Sunday night with Joe Blanton on the bump for Philadelphia. Andy Sonnanstine will get the start for Tampa Bay. Tampa Bay Rays starter James Shields pitched five and two thirds of scoreless baseball, and Rays hitters roughed Phillies starter Brett Myers for two runs in the bottom of the first as Tampa Bay defeated the Philadelphia Phillies 4-2 Thursday night. The victory ties the 2008 World Series at 1-1. One of the most deflating experiences for a pitcher is to walk the first batter he faces. Unfortunately for Brett Myers, that is how he started the bottom of the first by walking leadoff batter Akinori Iwamura. Things got worse quickly for Myers as the next batter Rays center fielder B.J. Upton hit a single to right. Phillies right fielder Jayson Werth committed an error on the play, putting runners on second and third with nobody out. Myers got Carlos Pena and Evan Longoria to both groundout, but a runner scored on each play, putting the Phillies in the hole 2-0. Myers got back into trouble in the second, as Catcher Dioner Navarro hit a one out single and would score later in the inning as Upton drove him in with a single to right. At the end of two Tampa Bay led 3-0. The Rays would increase their advantage in the fourth, as Cliff Floyd opened the inning with a single up the middle. Navarro hit a bloop single into center putting runners at first and second with nobody out. Rocco Baldelli grounded into a fielders choice putting runners at the corners with one away. Floyd scored on a Jason Bartlett sacrifice to Myers, making it a 4-0 contest. The Rays were done scoring for the evening, but it was enough as Tampa Bay starter James Shields was able to pitch himself out of jams throughout his performance. The Phillies finally got on the board in the top of the eighth as Eric Bruntlett hit a pinch hit dinger off Rays reliever David Price making it a 4-1 game. Price would give up his second run in the top of the ninth, as Carlos Ruiz opened the inning with a double. He scored as Jayson Werth got to first on an Evan Longoria error at third. But Price was able to get out of the inning without further damage, giving the Rays the win. Shields had karma on his side as he pitched five and two thirds of an inning allowing nine base runners with seven hits and two walks. However he did not allow a run. Myers threw seven innings allowing four runs on seven hits and three walks as he took the loss. The series resumes Saturday night with polar opposites on the mounds for the opponents. The Rays will give the start to flame throwing youngster Matt Garza, while the Phillies counter with wily veteran Jamie Moyer. The Philadelphia Phillies drew first blood, as they defeated the Tampa Bay Rays Wednesday night at Tropicana Field 3-1 in game one of the 2008 World Series. The Phillies who had an extended vacation while the Rays had to play seven games in the ALCS, did not appear to have lost their mojo. Cole Hamels who pitched the game in the NLCS to put the Phillies in the series for the first time since 1993, worked out of some tough situations to get the victory. Tampa Bay starter Scott Kazmir, found himself behind early in the contest, as Philadelphia second baseman Chase Utley hit a 2 run homer to right in the first inning. Kazmir fell behind 3-0 in the top of the fourth as Carlos Ruiz grounded out, but Shane Victorino scored on the play. The Rays got on the board in the bottom of the inning as Carl Crawford hit a solo blast into right off of Hamels. Tampa Bay turned it into a 3-2 game in the bottom of the fifth, when second baseman Akinori Iwamura had a RBI double into center. But Hamels settled down after that, pitching seven innings before Ryan Madson came in from the bullpen in the eighth. Madson pulled a scoreless inning, and closer Brad Lidge got the Rays out in order in the ninth for the save. Hamels gave up 2 runs on 5 hits in his seven innings, he walked 2 and struck out 5. Kazmir lasted six innings, allowing 3 runs on 6 hits, with 4 walks, and 4 strikeouts, as he took the loss. Game two will be played Thursday night, Brett Myers gets the start for Philadelphia, James Shields will be on the mound for Tampa Bay. The Tampa Bay Rays are heading to their first World Series in franchise history, after defeating the Boston Red Sox Sunday night 3-1. 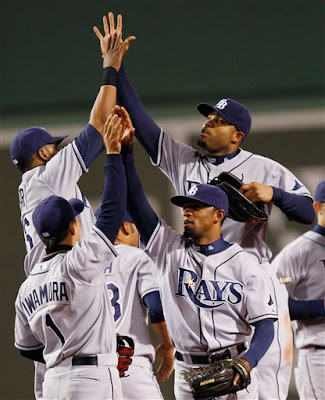 The Rays who had once held a 3-1 series advantage in the ALCS, found themselves hosting the Red Sox in game seven with the series tied 3-3. But in a rematch of the starting pitchers from game three Tampa Bay's starter Matt Garza came out on top once again over Boston starter Jon Lester. And unlike most of this year's ALCS, this was a game where the pitching dominated the proceedings. Red Sox second baseman Dustin Pedroia, put his team on the board in the first as he hit a dinger into left, giving Boston a 1-0 lead. That would be the final run for Boston this season. The Rays tied the game in the fourth when Evan Longoria had a RBI double off of Lester. They took the lead in the bottom of the fifth on a Rocco Baldelli RBI single. Tampa Bay added an insurance run in the seventh when Lester gave up a solo homer to Willy Aybar, making it a 3-1 contest. After giving up the first inning homer to Pedroia Rays starter Matt Garza had his second masterful performance of the series. Garza allowed just the 1 run on 2 hits, walking 3 and striking out 9. Lester pitched well, but not well enough to get the win, giving up 3 runs on 6 hits, and struck out 8 in the loss. Boston put up a valiant effort to climb back out of the hole they had dug themselves into. But unlike 2007, when they were able to overcome the same situation and defeat the Cleveland Indians in the ALCS, this time they fell short. The Rays will host the first game of the World Series as they take on the Philadelphia Phillies Wednesday night. This should be a well matched World Series, as both teams have a lot of young talent. The Rays have shocked the baseball world this season, as they had their first winning season, their first trip to the playoffs, and now their first appearance in "The Show." They have exceeded expectations all season long, now we find out if they can do it one more time. To say that the Boston Red Sox over the last few years have had a flair for the dramatic over the last few seasons, would just be stating the obvious. For some bizarre reason they play their best baseball in the ALCS, once their collective backs are against the wall. They of course came back in the ALCS in 2004 against the New York Yankees after falling behind 3-0 on the way to their first World Series win since 1918. Last year the Bo-Sox were down 3-1 to the Cleveland Indians in the ALCS, and came back and won the World Series again. Boston looked dead and buried Thursday night, going into the bottom of the seventh inning trailing the Tampa Bay Rays 7-0. The Rays had come into the contest, with a 3-1 series edge, and it looked like they were heading to the World Series to take on the Philadelphia Phillies. However the Red Sox were not ready to go home for the season, and proceeded to destroy the Rays bullpen. Boston scored 4 runs in the seventh, 3 in the eighth, and J.D. Drew won the game in the bottom of the ninth. Saturday the series came back to Tropicana Field for game six, as the Rays hoped to stop Boston's momentum and end the ALCS. But for the second game in a row, Boston was not ready to allow their season to end. 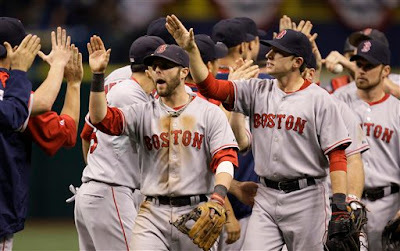 The Red Sox after falling behind 1-0 in the first defeated the Rays 4-2, setting up a game seven Sunday night. Boston starter Josh Beckett has not had a strong post season. When he faced the Rays in game two of the series he was knocked out of the game in the fifth inning after giving up eight runs. Although Beckett had a rocky first inning, the man on the mound for Boston had a far better performance than he did his last time out. Tampa Bay center fielder B.J. Upton who has been on fire this whole series, hit his fourth home run of the ALCS in the first, putting his team ahead 1-0. Rays starter James Shields who was the losing pitcher in game one, gave up a homer to Kevin Youkilis in the bottom of the second which tied the game at 1-1. The Red Sox would take the lead as Dustin Pedroia scored on a Youkilis ground out in the bottom of the third putting Boston ahead 2-1. But the Rays answered with their second long ball of the day as Josh Bartlett hit a solo shot to left, and the game was tied 2-2. The Red Sox would take the lead for good in the top of the sixth. Boston catcher Jason Varitek who had been almost silent offensively in the series, put the club up 3-2 with is first round-tripper of the series with two outs in the sixth. Boston added an insurance run in the inning as Big Papi David Ortiz had a RBI single, making the final score 4-2 Boston. Beckett gets the win for the Red Sox, Shields takes the loss for the Rays. The two teams will meet Sunday night with a rematch of the game three pitchers. Matt Garza will be on the mound for Tampa Bay, Jon Lester on the hill for Boston. The Tampa Bay Rays were on their way to their first World Series Thursday night as they led the Boston Red Sox 7-0 after six and a half innings. The Rays had lit up Boston starter Daisuke Matsuzaka for 5 runs in just four innings. They added two against Red Sox reliever Manny Delcarmen in the top of the seventh. The Rays starting pitcher Scott Kazmir had a stellar performance as he pitched six scoreless innings, giving up just two hits in the game. The usually raucous Fenway Park was almost silent, as the fans of Red Sox Nation figured their season would be over in just nine outs. The club had dug themselves too deep a hole too possibly climb out of. The Bo-Sox never made that ninth out as they torched the Rays relievers for 4 runs in the seventh, and tied the contest with 3 more runs in the eighth. Boston completed the second biggest come back in MLB post season history in the bottom of the ninth as Red Sox right fielder J.D. Drew hit a two out RBI single off Rays reliever J.P. Howell. Boston won the game 8-7, and now trail 3-2 in the ALCS, with the series shifting to Tropicana Field for game six on Saturday. Dice-K who had pitched masterfully in the game one victory for Boston, struggled from the onset Thursday. B.J. Upton hit a 2 run homer off Matsuzaka in the first making it quickly a 2-0 Tampa Bay lead. The long ball would get the better of Dice-K again in the third as Carlos Pena hit a 2 run shot to right. Evan Longoria hit a solo blast to left and the Rays were ahead 5-0. Upton drove in two more runs off Delcarmen with a RBI double in the top of the seventh. Boston is no stranger to adversity in the post season. They of course came back in the ALCS in 2004 against the New York Yankees after falling behind 3-0 on the way to their first World Series win since 1918. Last year the Bo-Sox were down 3-1 to the Cleveland Indians in the ALCS, and came back and won the World Series again. Whether they can accomplish a series come back against the Rays remains to be seen, but they were not ready for their season to end Thursday night. Red Sox second baseman Dustin Pedroia got his club on the scoreboard with a RBI single off of Grant Balfour in the bottom of the seventh. Big Papi David Ortiz then hit a 3 run homer to right off Balfour, and the team was back in the contest at the end of the frame down only 7-4. Dan Wheeler got the last out for Tampa Bay in the seventh, but did not fare well in the eighth. Drew hit a 2 run blast to right, and then Coco Crisp tied the game with a RBI single, setting Boston up for the win in the ninth. Justin Masterson got the win for the Red Sox, Howell took the loss for the Rays. James Shields will try to wrap up the series for Tampa Bay Saturday, Josh Beckett will look to extend it for Boston. The Philadelphia Phillies are going to the World Series after knocking out National League West division winner the Los Angeles Dodgers in game four of the NLCS by a score of 5-1 Wednesday night. The Phillies are in their first World Series since losing to the Toronto Blue Jays in 1993. Philadelphia shortstop Jimmy Rollins set the tone for his team with his first at bat a leadoff home run off Dodgers pitcher Chad Billingsley, and the Phillies never looked back. Phillies starter Cole Hamels got his second win of the series, and he pitched masterfully. Hamels threw seven innings scattering just five hits, and giving up just one run. Dodgers left fielder Manny Ramirez who hit .533 for the NLCS hit a solo homer in the sixth. The Phillies scored two runs in the third as Ryan Howard and Pat Burrell each had RBI singles to make it a 3-0 contest. Fielding gaffes cost the team from the West Coast in the fifth as two errors by Dodgers shortstop Rafael Furcal resulted in a 5-0 game. Hamels get the win for the Phillies, while Billingsley takes the loss for the Dodgers. The Phillies now wait to find out where they will start the World Series, as it starts in the American League park. Tampa Bay leads Boston in the ALCS 3-1, with game four scheduled for Thursday. The "Cinderella" Tampa Bay Rays not only look like they are on the verge of their first World Series, they are embarrassing the reigning champs of baseball in the process. The Rays are just one win away from their first time to the "Big Dance" after simply humiliating the Boston Red Sox Tuesday night at Fenway Park 13-4. They now lead the ALCS 3-1, and have the chance to clinch their first American League pennant Thursday night in front of the Boston faithful. Boston elected to give the start to 42 year old knuckle ball specialist Tim Wakefield in game four. When the veteran's out pitch is doing it's magic, Wakefield can make batters look silly. When it's not, he is not much more effective than a batting practice pitcher. Tuesday night, the magic was not working. The long ball has been the main weapon of the Rays since game two of this series, and it was used quite effectively Tuesday night. One of the nicest stories of the success of Tampa Bay this season has been the resurrection of the career of first baseman Carlos Pena. Pena was always one of those players that never performed up to the expectations that were foisted upon him. At the beginning of the season Pena was on the scrap heap of baseball. However he has proven to be a key component of his team's success all season, and in this series in particular. Pena put the Rays on top in the first with a two run blast into left off of Wakefield. Evan Longoria hit a solo homer to left, and Boston found themselves in a 3-0 hole before they even came up to bat. Tampa Bay DH Willy Aybar knocked Wakefield out of the game in the top of the third as he hit a two run dinger to left putting the Rays ahead 5-0. Boston got on the board in the bottom of the frame as catcher Kevin Cash hit a solo homer to left off Rays starter Andy Sonnanstine, at the end of three innings the Bo-Sox were down 5-1. Aybar made it a 6-1 game in the fifth as he drove home Carl Crawford with a RBI single. The Rays in the sixth battered their second Boston pitcher of the night, this time reliever Manny Delcarmen. Tampa Bay showed that they could play small ball as well as they dinged up the Red Sox reliever for five runs with a series of singles and bases on balls. At the end of the frame it was 11-1 Tampa Bay, and the Bo-Sox would need to stage a miracle rally to turn this one around. Boston put a run on the board in the seventh as David Ortiz scored on a Kevin Youkilis ground out. But the Rays got two more back in the eighth, as Crawford drove home Pena with a RBI triple. He scored on a RBI single by Aybar making it 13-2. The Red Sox added two meaningless runs in the bottom of the frame. Dustin Pedroia had a RBI single, Youkilis drove him home with a double. Sonnanstine got the win for the Rays, Wakefield took the loss for the Red Sox. The two teams will match up Thursday night for game five, with a rematch of the game one starters. Daisuke Matsuzaka who has the only win for Boston will look to extend the series, he will face James Shields for the Rays. Matt has been involved in sports media for over ten years, with experience covering the NFL, NBA, and MLB for the past 13+ years. Stephen Rhodes has been a diehard Cincinnati Reds and MLB fan since the early 70's; his insight into today's game should make for interesting reading at The Game Of Baseball.